Strengthen your facility’s reputation while decreasing the likelihood of lawsuits. If one resident has a positive and pleasant experience in your care, they’ll tell their families, and their families will tell their loved ones and friends. That’s the importance of good customer service—which we often take for granted. We say we strive for it, but how do we ensure it? 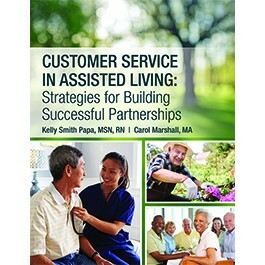 Take action and boost your facility’s reputation with Customer Service in Assisted Living: Strategies for Building Successful Partnerships, a guide to cultivate strong customer service skills in your nurses, frontline staff, and any other staff members who interact with residents and families. The book provides insight into building partnerships between residents, families, staff, and the media to manage risk and avoid litigation. Developing an effective customer service program is the first and most essential step in protecting your organization’s reputation and showcasing what it has to offer. By providing proper family education and handling adverse events in a straightforward manner, you can reduce the likelihood of legal action being taken. Authors Kelly Smith Papa, MSN, RN, and Carol Marshall, MA,offer a fun, innovative approach to learning with instant access to everything you need to conduct training, including customized PowerPoint presentations, in-services, and templates to meet the needs of your organization. Kelly Smith Papa, MSN, RN, is the corporate director of learning at Masonicare in Connecticut. She is responsible for developing the Masonicare University and creating a culture of continued learning. Papa’s experiences in the field of aging services include serving as a director of nursing, clinical educator, leadership coach, and dementia care consultant. For over six years, she has studied the disciplines of a learning organization and how they apply to aging services. She has researched models of application of these disciplines to create a workforce that is engaged, innovative, and more adaptable to change. Papa has presented at numerous state and national conferences on a variety of topics, including building learning organizations, creativity in staff development, person-centered care, dementia care, leading change, and leadership development. She has written books and articles on dementia care and creative staff development. In 2013, Papa served as chair of the workforce development committee for Connecticut’s task force on Alzheimer’s disease and dementia. She earned her BSN from Saint Anselm College in New Hampshire and her MSN from the University of Saint Joseph. She is a fellow of the LeadingAge Leadership Academy and received the Nightingale Award for Excellence in Nursing in 2011. Carol Marshall, MA, is a risk management specialist based in Fort Worth, Texas. For the past 18 years, she has trained managers and staff members in long-term care facilities across the country about the benefits of exceptional customer service and risk management. Marshall has offered training programs at numerous state conferences, professional groups, and facilities. Chapter 9: Is That the 60 Minutes Van in the Parking Lot?